Welcome to the natural and protected beauty of the National Parks of the Eurobodalla Nature Coast. See an overview of each park by scrolling down through this page or by jumping to specific parks from the list above or the map at the left. Visit the album for more beautiful photos of the National Parks of the Eurobodalla Nature Coast. You'll see native wildlife and magnificent scenery. Rugged and remote this is another park for the serious. Joining the Morton National Park, the Budawang is only accessible to walkers in the Eurobodalla via the Kings Highway between Batemans Bay and Canberra. The Budawang Range is spectacular with sculptured rock faces and mesa like peaks. There is a walking trail to the top of Mt Budawang and although access is not easy, there are plenty of alternative hard walks. Most of this park has been declared wilderness area. The Budawang National Park has many significant Aboriginal sites including paintings and drawings in rock shelters. It is also home to many threatened native plants and animal species. 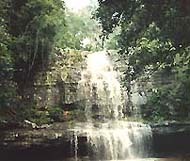 The Murramarang National Park is situated at the southern end of the Shoalhaven area. It includes coastal pockets running from Pretty Beach to North Durras and from South Durras to North Head at Batemans Bay and also a precious area bordering Durras Lake. This park's most famous asset is Pebbly Beach, where kangaroos have been known to enter the water. Generally these roos lounge around waiting to be pampered by their visitors. Many walking tracks are marked throughout the park and accommodation is available in a variety of styles including camping and cabins. For more details take this link. Access to the Deua National Park, the largest in the Eurobodalla is mostly via Moruya. The Deua straddles the eastern escarpment and is mostly in very remote country. There are many walks in the park, varying from very difficult in the wilderness and escarpment areas to easier walks near the Deua River. 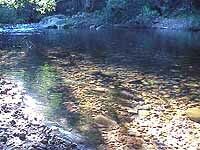 Camping is available along the Deua River at Bakers Flat along the Araluen Road. There is also accommodation and local guide services available from farmstay properties near Moruya. This newly declared park comprises a number of segments of beautiful coastal forest and wetland areas running from Moruya Heads in the north to the Cape Dromedary region in the south. The park contains spotted gum forests, wetlands and estuaries as well as some of the most significant coastal lakes on the Eurobodalla coast. The various elements of the park are easily accessed from the main towns south from Moruya including the small coastal villages of Congo, Meringo, Potato Point, Dalmeny and Mystery Bay. This is an important habitat for waterbirds and many native animals, including the threatened long-nosed potoroo. About 9km off the coast from Narooma, Montague Island is home to large colonies of seals, little penguins and many variety of seabirds. 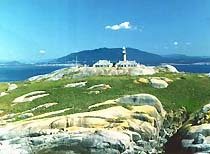 Also home to a lighthouse and several historic buildings, the island also posseses unique flora species. Although there is no accommodation on the island, there are many options in nearby Narooma, and charter boats carry visitors to the island regularly, as well as conducting popular whale watch tours for which the area is noted. This large, mountainous wilderness park protects the headwaters of several important river systems on the coast. Animal populations have remained relatively undisturbed in Wadbilliga which also exhibits a wide diversity of birdlife. The park also contains fine examples of open forest, woodland, heath, swamp, bogs and numerous rainforest pockets. As in the Deua, Wadbilliga is well suited for long, demanding bushwalks and overnight camping although there are no constructed paths. Camping facilities are available at Wadbilliga crossing, Lake Creek camping area and the Cascades with access from Cobargo. The imposing bulk of Gulaga (Mount Dromedary) dominates the coastal landscape from as far north as Batemans Bay. The mountain itself stands above the southern village of Tilba Tilba. 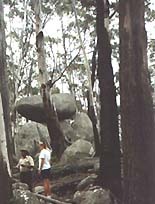 Gulaga has great spiritual significance to the local aboriginals and features huge granite rock formations including many finely balanced boulders. The wide variety of wildlife and vegetation also adds to the mystery and value of this fascinating mountain. From the summit, there are magnificent, expansive views far along the coast. The walk is quite manageable (allow around 5 hours) and local Koori guided tours can be arranged.